Are there kids that don’t love beach-combing? Mine certainly love it. They love picking up rocks and shells and everything else they can get their hands on… and they love bringing this stuff home. Now, we do have a little nature museum, we do have a little treasure chest and we do use some bigger pieces for our pretend-ocean play… but what to do with the little broken pieces we got? We decided to make a little candle holder and I must say it was a very rewarding experience for all. You just need clay, tea candle and some shells/rocks. Make a little ball out of the shell and push the tea candle in the middle of it. Then decorate with the shells and rocks – pushing them inside (a lot) and you are done. Simple! This candle holder was done by my daughter when she was 1.5 years old. Tip: once the clay dries, some shells may fall off – just slide them back in or us a little bit of glue. 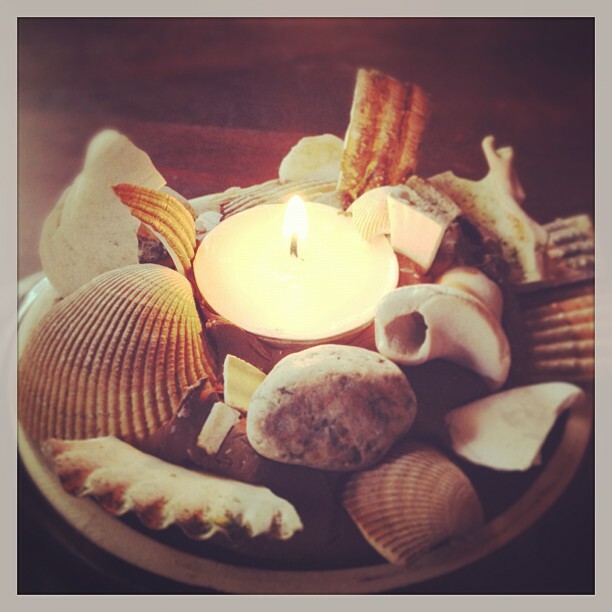 This entry was posted in Art Projects and tagged art, ArTree, beach, candle, clay, holder, kids, preschool, rocks, shells. Bookmark the permalink. ← Is Art Education Worth it?